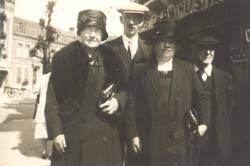 Ellen Gray, Sunside, Kennethmont was a member of the group who visited the cemeteries and former battlefields in July 1929. 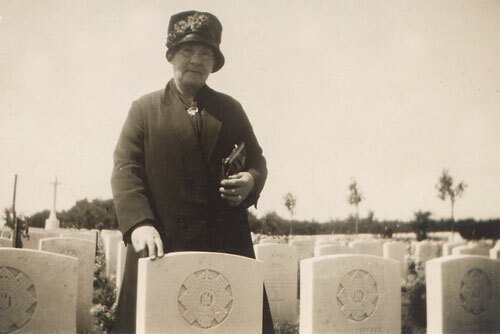 She is pictured here standing over the grave of her youngest son Charles at Savy British Cemetery. Sixty North-East pilgrims, drawn principally from Aberdeen, but including a number also from Elgin and certain other centres, have returned home from the war areas of France after visiting the graves of relatives who lie buried in British cemeteries there. The most gratifying feature of the pilgrimage was the fact that every one of the 60 were able to see the graves of their loved ones, though, in some cases they went without knowing where the graves were situated. The records available, however, are so complete that they were able to trace the particular cemetery they desired to visit. The pilgrimage produced many touching scenes when widows and mothers had their fondest wish fulfilled in being at last able to kneel before the graves of husband or son. For the greater part of the time the party were stationed at Arras, later going on to Ypres, where they remained until the time came for the return home. Various cemeteries were visited, and the pilgrims were able to read the names of their dead on the great memorial at Menin Gate and at other memorials. Many places of interest were seen, and the week was altogether a memorable one for everyone. It was conducted by Mr A B McLeod, the British Legion secretary for Aberdeen, who was assisted by other officials of the Legion. One of these, whom I saw on his return to Aberdeen, related to me the incidents of the tour. "All the arrangements were in the hands of the Legion, " my informant said, "and most of the pilgrims were women-folk who were going to visit the graves of husbands or sons". 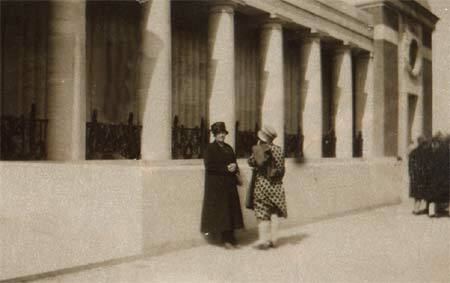 It was a solemn pilgrimage, as you can imagine, for to these women the act of visiting the spot where their loved ones lay was a sacred thing. It was also, many of them told me, a source of real inward satisfaction, and it set their hearts and minds at rest. It has been their greatest wish to visit the graves, and now that they have been able to do so they are content. "The pilgrims also derived great comfort from the beautiful way in which the various cemetries are kept. When we were there flowers of every kind were in full bloom, and everything was neat and tidy. I understand that each 1000 graves have a British ex-Serviceman in charge of them, and in this way each grave gets equally good attention". "During our stay at Arras the time was mostly spent in visiting the graves of relatives buried in the cemetries there, while we also went to Beaumont Hamel and Newfoundland Park. At the latter place is situated the memorial to the 51st Highland Division while trenches are also to be seen in the state in which they were at the end of the war". "At the Vimy Ridge we saw the famous Grange Tunnel, built by the Canadians, which stretches for over twenty miles in all directions beneath the surface of the earth. service, which was conducted by Mr Middleton, one of the Elgin pilgrims. Mr Middleton carried throught the service in a most impressive manner, and when it was over a wreath of poppies was placed below the panel which bears the names of Gordon Highlanders who have no known grave". "The party later visited most of the points of interest on the Ypres Salient - Hill 60, St Julien, and other places - and at nine o'clock at night the great majority returned again to the Menin Gate to hear "Last Post" sounded. Every night, on the stroke of nine, buglers of the British Army sound this call in memory of the dead". 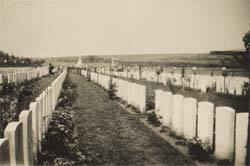 "A number of the pilgrims went also to the cemetery at Tyne Cot to ses the graves of their relatives. This is the biggest cemetery containing British dead in the world. Over 11,000 lie buried there, but the French have a bigger cemetery still at Notre Dame Laurante, which we visited on our way from Arras to Ypres, there are 100,000 French sGraves". The day before we were due to return was spent by most in going to Ostend, for by this time the pilgrimage was over. Our journey home was a very pleasant one, and we all came back very satisfied with everything that we had seen. 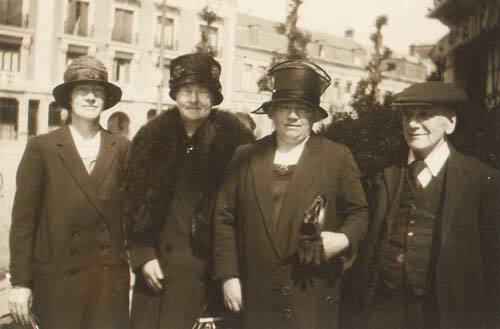 Probably a number of mothers and widows who were with us will never have another opportunity to revisit the cemeteries, but they are now content in the knowledge that they have been able to visit the graves and that they are being given every care and attention". Ellen Gray and other bereaved families. Visiting the Menin Gate Memorial to the Missing at Ypres, Belgium. in The Ypres Salient and who have no known grave. The Fallen were not the only casualties of The Great War of Nations. Those left behind continued to suffer long after the conflict ended. by kind permission of his nephew Robert Smith, Sunside.